Every year I make several New Year's resolutions. We all do it. There's something about a fresh start that is motivating and inspirational! In the past years, my New Year's goals have been to eat better, work out more, be a better wife, friend, be more disciplined in my quiet time etc... This year, as I was pondering the New Year and all of the things I want for myself, I realized that my goals were very "me" oriented. They have always been about making me happy or making myself a better person. There's nothing wrong with that, but the pattern I've noticed in years past is that I always end up disappointed. Le'ts be honest, I quit working out after about week 3. There's no humanly possible way to resist chocolate, so you can throw eating healthy out the window, and without chocolate, I will always make mistakes as a wife and mother. Ok, that happens even without chocolate, I admit. So this year, I've decided to make my New Year's Resolution something that isn't about me. I'm done making silly promises to myself just to give up after the first month because I've already failed. This year, my goal is worth much more than looking good, being healthy, or being a good person. It has eternal value! My New Year's Resolution is to live each day to bring glory to my Father in heaven. 1 Corinthians 6:20 ...for you were bought with a price. So glorify God in your body. There is so much freedom in this resolution! Even on a day that I barely make it out of my pj's much less make it to the gym, I can keep this resolution. I don't have to be disappointed in myself at the end of a lousy day if I can look back knowing that the way I lived that day was glorifying to the Lord! In some ways maybe this goal is a little bit more difficult than others. It's a lot easier for me to eat a healthy meal than it is to have a good attitude when my toddler colors all over my newly painted cabinets (true story!). But the nice thing about this resolution is that I don't have to throw it out even if I fail one day. I can wake up the next day with a fresh start just like the beginning of a new year! Lamentations 3:22-23 says, The steadfast love of the Lord never ceases; his mercies never come to an end; they are new EVERY MORNING; great is your faithfulness. 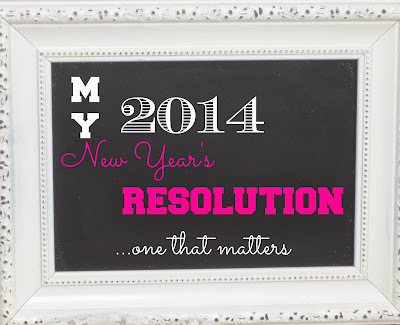 So for all you busy mamas out there, let's make a more reasonable goal for 2014. Now keep in mind, that part of you glorifying God in 2014 may include working out, eating healthy, and working on your role as a wife and mother. But when your focus is on the Lord rather than on yourself, those things are worth much more! 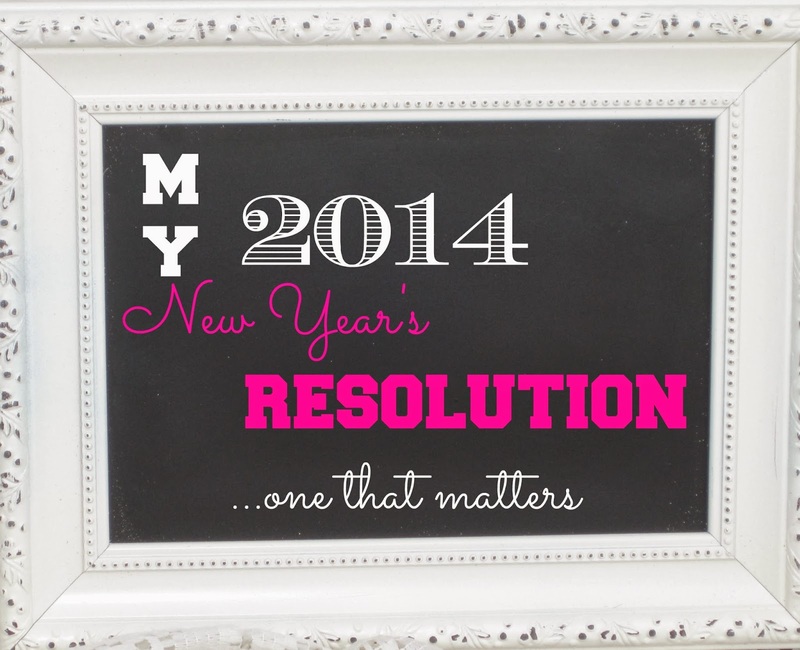 Let's give 2014 to God and watch together what He does in our lives as we give Him glory! Psalm 34:3 Oh magnify the Lord with me, and let us exalt His name together! I feel similar about resolutions. I heard this great idea to have a Word of the Year. That way you can still make mistakes but keep striving for that word. I dont know the last time I've made a resolution b/c when i've made em in the past I've never done em. first Cor. 10 is the best catch-all for eating, treating our bodies with respect and care. You are right, the smaller picture of focusing on what NOT to do, what to DO...it all wears thin. But if we try to honor God, remembering our body is a temple of the Holy Spirit, the big picture makes more sense. 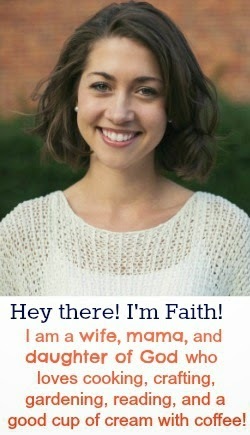 Here's to both of us, trying to take that scripture to heart! Great scripture, Corin. 10. It covers everything....how we should eat, treat our bodies. I pray we are both successful this year in taking this to heart!